A group of steel industries situated in the district of Chittagong, Bangladesh, has engaged NRIEMT of Kolkata, India, to study the entire area in and around of their proposed plant areas stretching from Chittagong town in the south to Mirsarai (latitude 22°45′01″ N and longitude 91°35′15″ E) in the north up to the Feni River, Chittagong, Bangladesh, with a length of 70 km (approx) and width varying from 3 to 12 km. 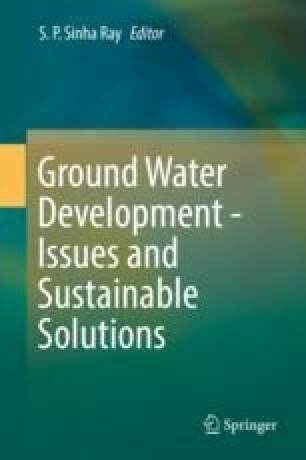 This study is essential for obtaining a clear picture of the prospects of groundwater and surface water, and this paper deals with various problems of groundwater. The present study has thrown light considerably to the fresh groundwater regime which occupies underneath Karnaphuli–Feni interfluve. Being an extension of Sitapahar, the eastern part of the area is characterized by somewhat rugged and irregular topography. The study area comprises a continuous succession of sandstone and shale. A clear picture about the subsurface deposition of different lithological strata has been revealed from both VES and electrical logging report as well as from a number of drilling of production tube wells at different locations. The entire investigated area has been categorized in 3 (three) segments, namely, north, central and south. The sediments of Tipam group comprise medium- to fine-grained and semi-consolidated sand and form the main aquifer system of the area (equivalent to Tripura of India extension). The chemical quality of groundwater is overall good, but there is an indication of salinity in the aquifers that exist at a depth of approximately 85.00–125.00 m from north to south. The iron content is also high beyond permissible limit. This systematic scientific approach has established the existence of a moderate to large potential of groundwater resources in the Karnaphuli–Feni interfluve area. These precious resources will go a long way in supporting industrialization in this otherwise underdeveloped tract of land which will ultimately usher to a new socio-economic horizon in coming years. The author expresses his gratitude to the BSRM, Chittagong, Bangladesh, for giving opportunity to publish their paper. The author is highly grateful to Dr. S.P. Sinha Ray, Former Member, Central Ground Water Board, for giving his valuable inputs, suggestions, guidance and critical evaluation during the preparation of the paper. The author would like to express sincere thanks to all the executive directors (hydrogeology) and project scientists of NRIEMT engaged in this project.